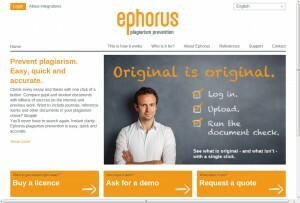 I blogged on Ephorus last summer when we tested it as a potential solution to the issue of students submitting plagiarised coursework in languages other than English. In our (non-systematic) testing, it looked as if Ephorus might outperform Turnitin in this specific area. We’ve now subscribed to the service and it is integrated into Learn (Moodle) as another assignment type, alongside Turnitin. Tutors on the University Wide Language Programme will now be employing it on modules they teach. I’ll report in due course on how they get on.